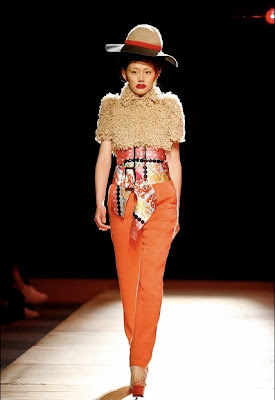 Interesting how the show I attended for Japan Fashion Week that wasn't cancelled was NOZOMI ISHIGURO Haute Couture 2011-2012 AUTUMN / WINTER COLLECTION. 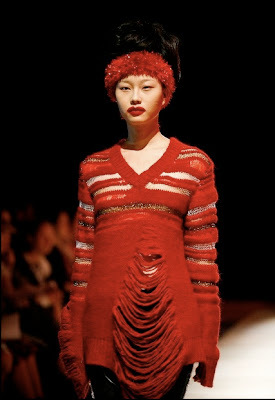 Nozomi Ishiguro has worked in Comme des Garcons, JUNYA WATANABE comme des garcons and tricot comme des garcons for 12 years before founding his own atelier in Tokyo. 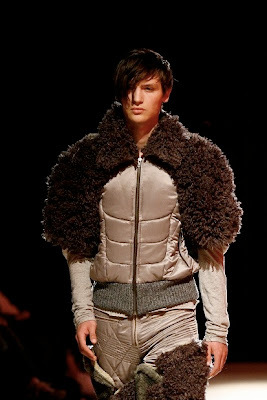 This collection was good because it had a concept and youthfulness. This season includes more textures that augment the designers' aesthetic consisting of layering, draping and vivid colors. Texture is apparent in the use of faux fur incorporated in the designs. What looks like fur is actually hand-knitted yarn. I am particularly fond of the mannish coats, red palette and distressed fabrics. The show started with red light bulbs and the opening notes of the song "The Boulevard of Broken Dreams covered by Marianne Faithful ~ I walk along the street of sorrow. The Boulevard of Broken Dreams. Where gigolo and gigolette. Can take a kiss without regret. So they forget their broken dreams." Fitting as the collection draws inspiration from the song "As Tears Goes By" of Marianne Faithful, penned by Mick Jagger and Keith Richards. Although the bleak background with red lights was stunning it was difficult to take decent pictures. Blurry ones are mine. Fortunately, Tokyo Fashion Film has the whole collection in live broadcast. Runway photos by Koji Shimamura. 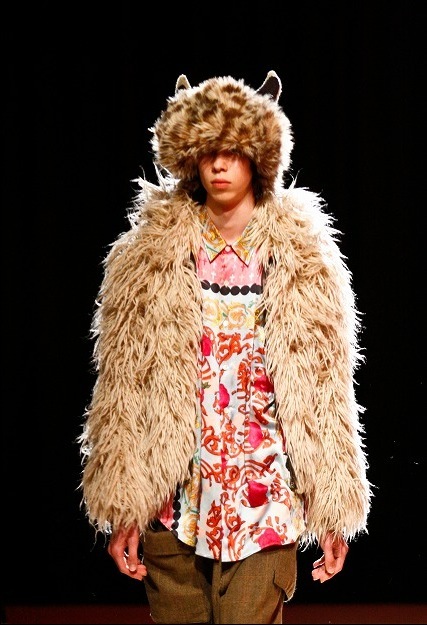 Like Tavi of the style rookie fame, who "scatters black petals on Rei Kawakubo's doorstep...". Comme des garcons is love for the intellectual. Rei Kawakubo created black as the color of Fashion's rebel yell. And enigmatically proved that "red is the new black". This vivid color is everywhere in this collection. What is the use of a book without pictures or conversations? Garage Sale "XTC Park" : TOGA XTCガレージセール"エクスタシーひろば"
Some of the photos do not belong to us. All photos are only used for commenting reasons. Simple theme. Powered by Blogger.